In The Loud House Lights Out Game: Find different light sources and give them to each Loud sister. Click and drag to shine the flashlight around the room, and click on an item to collect it. Combine items in your supply to see what happens. Drag things from your loot, shake things up, and solve puzzles. Click on items anywhere to get some helpful tips. Click on the next button to keep exploring after you are done in a certain location. That’s the basic things that you need to know about the game. So now that you know, start playing, and have a great time! 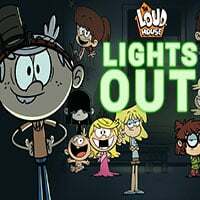 Enjoy and have fun in playing The Loud House Lights Out Game. Good luck. Also make sure to check out Senya and Oscar The Fearless Adventure Game, you may enjoy playing it.